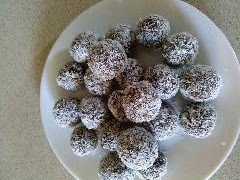 Bliss balls are super easy to make. Until recently, I knew them only by the name of Frooze Balls - sold in one of my favourite salad bars in Auckland, Revive. Ball them up, then roll in coconut shavings. The point is to only use raw and unprocessed, uncooked ingredients. I think we cheated a bit by adding vanilla extract. Put them in the freezer so they harden.